Is Team Truck Driving at Dot Right For Me? Team driving—where two drivers share a truck and alternate driving—has become a popular option for many truck drivers. For transportation companies, team driving can increase productivity as the freight is moved at a more continuous pace than it can be with solo drivers. This is because with team driving, one person can be behind the wheel while the other takes a break. The total carrier wage and mileage are then split between the drivers. Learn more about what makes Dot’s class A CDL team company driver position unique. What Is Unique About Team Driving? There are many types of people for whom team driving is an attractive career option. You’ll receive regular home time, regardless of what schedule your team decides is most practical. And if you simply love driving and being on the road, team driving may be for you. Teams typically drive more than non-team drivers and run more of the western U.S. states, which can be attractive to some individuals. What is a Typical Team Driving Schedule? Similar to a solo driver, team drivers are not automatically given a schedule and run off a 70-hour work week. Team drivers can anticipate running, on average, 5,500 miles each week. Dot also offers dedicated runs, which teams can bid on once they have been teaming with us for at least four months. Team drivers typically transfer loads to our distribution center locations or terminals. They may also deliver subject-to-count loads, custom hauls, and then make the respective pickups thereafter. Occasionally, teams will make deliveries and break down the loads if needed. With team driving, the truck is always moving, so there is always one driver doing the actual driving while the other sleeps and/or takes a break. The drivers will decide what schedule works best between the two team members. Some choose to split the daylight hours; others alternate days and nights. This is totally customizable based on the comfort levels of each driver. How Are Teams Paired Together? 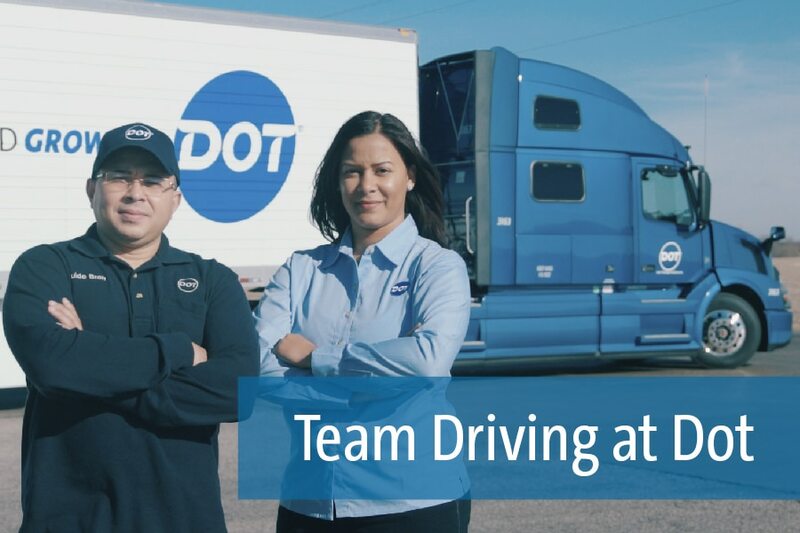 There are several ways our team drivers get paired up, and we have a combination of team drivers at Dot. Sometimes a husband and wife will team together, other times it is experienced teams who have come from other companies. Two solo drivers may ultimately decide they would like to team. If a Dot driver voices their desire to team, we will help watch for others who’d like to do the same. What Are the Steps to Becoming a Dot Team Driver? If both team drivers are currently driving with Dot, they will complete a 30-day trial run together to ensure this is the right fit for both parties. This allows drivers to get a taste for the team driving life. If the two drivers are newly hired students, the team will complete at least 90 days of individual driving experience as Dot drivers before operating as a team. This period begins upon release from training. Student drivers who wish to partner with an experienced driver will complete at least 90 days of individual driving experience as well. Team driving isn’t for everyone, but it can provide a comfortable and fulfilling lifestyle for many individuals! If you are interested in other driver job types, check out the many other options our trucking company offers. There’s something for everyone at Dot Transportation! Does team driving sound like the right career path for you? Take a look at our open job listings, and apply today!